Is it a good idea to “just let the car insurance companies handle it” after a car accident? I was injured in a car accident and the insurance adjuster does not want to offer me what I believe my case is worth. What should I do? 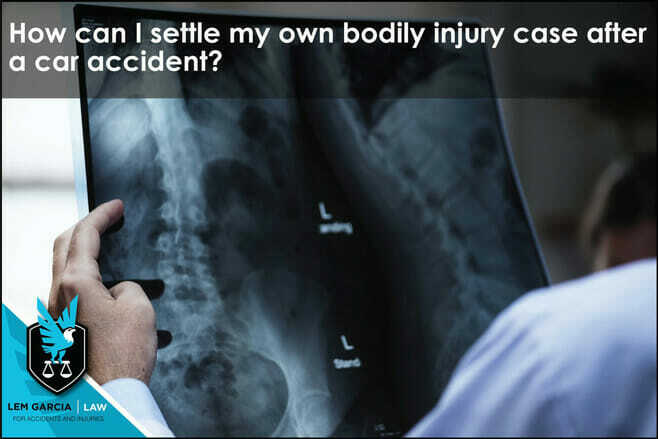 How can I settle my own bodily injury case after a car accident? If you want to settle your own bodily injury case after a car accident, it is very important that you speak to a personal injury lawyer first. An experienced personal injury lawyer will be able to guide you in the right direction and tell you whether you should have an attorney or if you have the type of case that can be settled without the help of an attorney. If you are adamant about handling your own case even though an attorney tells you that you should be represented by an attorney, you should speak to several other attorneys to see if they feel the same way. If numerous attorneys tell you that you should have an attorney’s help on your case, you should strongly consider it. Most attorneys will only want to represent you if they can add value to your case. If they do not feel as though they can add value to your case, they should not take your case. If you are in California and are truly interested in handling your case on your own, give us a call and we will be happy to give you free information about what can be done on your case. We will also give you an honest assessment on whether you will get the best result with or without a lawyer helping you. At Lem Garcia Law, we only take cases when we are confident that we can add value to your case. If we feel that you can get the best result on your own, we will let you know that it is better that you handle your own case. There are many cases that we turn away because we feel as though the potential client does not need the help of an attorney. When you need a car accident lawyer in West Covina, do not hesitate to contact Lem Garcia Law. We are here to help you and make sure that you recover as much as possible from the at fault party. By: Lem Garcia, car accident attorney in West Covina.